From hundreds of project experiences in our archives, we’ve selected a few stories to give you a sense of the range of our success. Check them out and come back for more. Every designed solution is as distinct as the challenge our clients bring to the table. Someone Editions is thrilled to be creating a folio of prints, Year of the Quiet Sun. This will be a limited edition run of 62 folios with artists' proofs, hand printed, signed and numbered. Year of the Quiet Sun will contain 18 unpublished collages by formidable Ludwig Zeller. Throughout the folio we will print Zeller’s poetry, taken from his vast body of work, in the Spanish original and in English translation by A.F. Moritz. Ludwig Zeller is world-renowned as a wonderful and highly unusual Chilean-Canadian poet and artist. His contributions have been unique and irreplaceable to Spanish-language poetry and international Surrealism, and he has published more than 40 poetry collections, some 50 poetry chapbooks and five books of collages. He has become an icon of the art of surrealist collage, thanks to having pushed the technique of collage farther than anyone has until now. Instead of cutting and pasting paper into background and foreground, as Max Ernst invented, Zeller deconstructs original engravings of flora, fauna, landscapes, and technical drawings, only to build and construct new images, to startling effect. His art is held in many public and private collections worldwide. He has exhibited his work internationally, including in France, Mexico, Brazil, Portugal, Chile, and at the Venice Biennale. Both his poetry and visual art have been the subject of many critical essays. The first artist in Someone's BOLD & beautiful series is Stephen Lindsay, an industrial designer and the founder of urbanproduct. When we met, Lindsay connected immediately with the idea of combining the best of each of our design disciplines to create a beautiful window display for our store front. With BOLD & beautiful, we express our appreciation for local artists and entrepreneurs by pointing a spotlight on them. We talked to Stephen Lindsay in his studio. A&D: 'Working with Someone was a very rewarding and joyful artistic process. They are great listeners to begin with. They listen to your idea and take it in fully. What they give back as result is the next level that you hadn't envisioned yourself. The Someones have impeccable taste in paper, great sensitivity to working within budget without compromising the quality and unsurpassed attention to details. They put their heart into the letterpress print. The result for us was an elegant, high quality and artistic package that carried the energy and the care of all people who had worked on it. ‘We enjoyed working with Someone on the invitation package so much that we said one day in the future we would go back for some sort of an artistic print project, at that time not knowing what exactly. 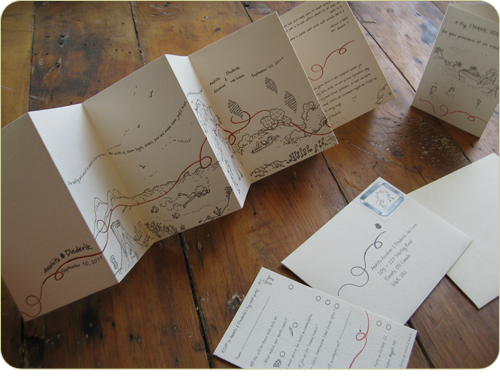 It wasn't long after that we came up with the idea of a poetry booklet for our guests that we went back to them. At Someone, they even taught us how to sew these precious booklets by hand. 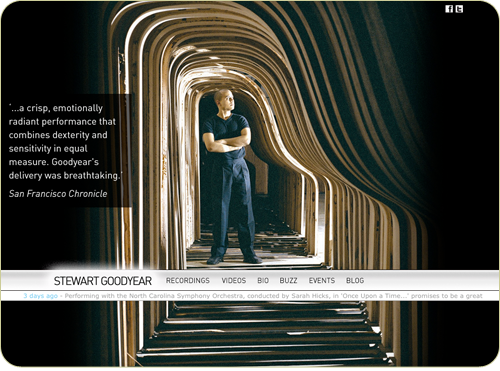 Stewart Goodyear is a young, athletic, classical pianist and composer with concert performances booked years ahead, world-wide. He’s thrilling audiences and garnering rave reviews. Someone built Stewart’s web site for launch in January 2011, and evolved Mr. Goodyear’s online visibility strategy, maintaining updates and capturing and sharing buzz with his growing fan base. Alcatel Lucent is committed to taking a leadership role at World Economic Forum meetings and summits across the globe. For the 2011 summit in Davos Switzerland, the company sent a delegation of lead executives to participate in the key events and discussions covering topics as diverse as the Climate Change Initiative, Anti-Corruption, Global Gender Parity, and Sustainability. The requirement for the Someone.ca team was to design and develop a web portal interface that would highlight Alcatel Lucent's key involvement and presence at the summit, and with the WEF in general. Further though, it was critical that the site would function as a platform to allow the delegation to publish content from the meetings using familiar web-based tools and mobile devices.